A power outage occurred at Six Flags Great Adventure in Jackson Township, New Jersey, Sunday afternoon, briefly stranding passengers on rides. The outage happened after a transformer blew around 2 p.m.
"Paramedics started running through the park," said Al Moore, a visitor at the park. "Then ambulances and fire trucks showed up in the parking lot." The park staff told visitors that the electricity went out, however the lights were still on in restaurants and shops, according to Moore. "The staff also was telling people to stop taking pictures and video on their cellphones," Moore said. Moore also told NBC10 a section of the park was roped off near Skull Mountain. No one was injured, according to police. Officials with the Jersey Central Power and Light Company say they're in the process of isolating the outage and it did not impact the entire park. 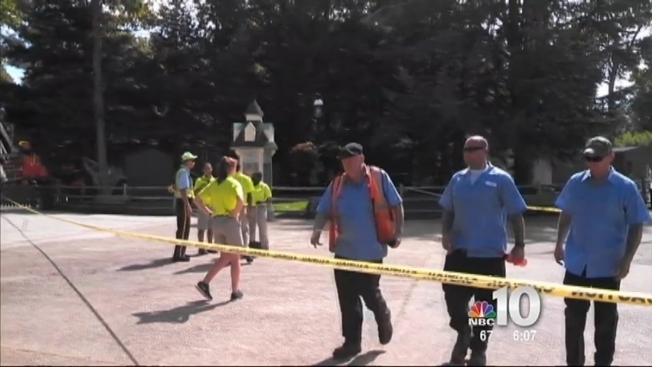 Kaitlyn Turi, the Public Relations Supervisor for Six Flags, told NBC10 some visitors were briefly stuck on rides during the outage but were safely removed. "All of our guests were safely unloaded from the affected rides within 20 minutes," Turi wrote. "Jersey Central Power and Light is here assessing the source of the outage. Power has been restored to portions of the park and, following a safety check, some rides have begun to resume normal operations."